July 12, 2018 7:00 A.M.
Also present from the City were Rich Simon – Director of Public Works, Dustin Bedore – Director of Electric Utilities, Joni Showalter – Police Chief, LeAnn Taylor – Municipal Court Clerk/Judge, Suzanne McClure – Economic Development Director, Mary Volk – City Clerk and Andrew Finzen – City Manager. Also present from Goodland USD 352 School District were Bill Biermann – Superintendent and Jessica Cole – President. FY 19 Budget – Andrew stated, supplemental budget pages from our last discussion have been distributed. I was asked to provide a sample loaded wage rate for a handful of employees from different insurance scenarios. The Commission asked for no tax increase and 2% increase in employee wages for 2019 budget. The additional full time police officer has been removed but the signage for police department has been added to achieve some of their goals. I have provided you each a summary of all the changes made. I would like to stress how important it is not to consider library as part of levy. If they go up we should not accommodate our budget for their increase. When the officer was in budget, the total computed levy was pushed up because of the calculation, so when the officer was removed it brought levy down to $1,663,787. History for bulk fuel has been provided so you see those costs were higher to justify the amount in budget. Mayor Linin asked, what happens when budget is more than we spend, what happens to difference? Andrew stated, what matters is bottom line, the remaining amount rolls over to next year as beginning cash to help subsidize future budgets unless used for another expense. With regards to police officer, we have representatives from school district to discuss potential of School Resource Officer (SRO). This correlates to discussion of officer needs. We wanted funding for an SRO and funding for half an officer has come from school district so willing to discuss with commission potential of cost share. Bill stated, several years ago we preliminarily looked at an SRO through a COPS grant but grant was not awarded. This year large school shootings has brought the subject back to surface. We have had incidents at our school that needed officer assistance. In April the discussion was revisited but never materialized. The District has prioritized needs and the State has provided SAFE Grants, so I submitted an application. We received $17,500 of the $30,000 grant request. We met this morning and would like to look at cost sharing the employee 50/50, but it is a City employee. The purpose and goal for the officer is to assist the school, community and relationship with law enforcement. Mayor Linin asked, it is a 50/50 cost share for what term? Bill stated, I feel we would want to be committed to process, not just one year. We would revisit the Memorandum of Understanding (MOU) annually to review changes needed. Vice-Mayor Brumbaugh asked, is this a one year grant? Bill stated, yes a one year school grant but feel if there is no future funding we can plan for future years regardless of whether there is a grant. City will have to look at their means of funding. If school had to make tough decisions there could be changes but it all depends upon State funding. Vice-Mayor Brumbaugh asked, if there is an event outside school can the officer assist the City? Bill stated, yes that is written into the MOU. Commissioner Fairbanks stated, but the majority of hours are spent at school. Mayor Linin asked, what about athletic events? Bill stated, they would attend and we would adjust hours so it does not run into overtime. Vice-Mayor Brumbaugh asked, if something happened at school and they are off duty would they be first called? Bill stated, yes I would think so. Law enforcement currently has a presence at our events but the personnel rotates. Andrew stated, from a City standpoint it is a cost share and we have ability to use officer over summer, but when school starts, officer will be back in school. We hope to prevent long run issues in community. Joni stated, I feel it is a great idea, it is not a full time officer for City but it helps relieve some of strain on officers. It certainly makes things easier when have history with students. The officer will help with matters at the school we currently face so beneficial for both parties. Vice-Mayor Brumbaugh asked, would the officer be at JR/SR High School more than at elementary? Bill stated, yes will have a presence in elementary schools but very visible in JR/SR High School. On breaks and during in service they would not be on school duty unless we are discussing crisis training. Jessica stated, we feel it would be good to have officer presence in schools. Commissioner Fairbanks asked, did Flex retire? Joni stated, he is ready to retire but not officially. Commissioner Fairbanks asked, is there money in budget to replace him? Joni stated, I am working for grants to get another dog. Bill stated, we utilize and appreciate use of the dog. It is a good resource used for more than just searches. Commissioner Fairbanks stated, I feel SRO is a very valuable tool and important to have. Much rather spend money there and try to get it to fit in budget. I feel it sends a good report to students in school. Do not know where we can reduce budget so may have to increase budget. Vice-Mayor Brumbaugh stated, I like numbers presented, they are closer to actuals. If we meet revenue and money rolls into unencumbered cash can we roll into a reserve to cover future unplanned events? Mary stated, yes transfers can be completed as long as it fits in the budget. Vice-Mayor Brumbaugh stated, I would like to start transferring extra money from bulk fuel to reserve for future use. Commissioner Schields stated, I was in favor of another officer so feel this will help with it being a cost share. We do not know what cost of benefits will be until December. It is tough to continue to pay 100% of insurance and put in for wage increases. Commissioner Garcia stated, I agree with need of SRO for safety of schools. I feel we can look at numbers and make it happen. We need to make this a priority for the schools. Vice-Mayor Brumbaugh stated, I feel having them in schools is better than having them out increasing traffic stops. If we have to make choices, I would rather have officer there. Mayor Linin stated, I like SRO concept, felt it was important when discussed previously. When school cost shares it makes it more feasible. Police budget has increased a lot and citizens do not see how our department runs compared to Sheriff or KHP. They feel we have enough law enforcement officers in City. I feel we have enough officers and should use an existing officer as SRO. Commissioner Schields asked, if they are short and it is tough to make schedules now, how are you going to use an existing officer? Mayor Linin stated, I feel maybe we ask too much of officers. Our population is not increasing, how much further can we expand any department? This does not just apply to the police department. Citizens are paying the bills. I have intentionally asked citizens about increasing police staff; they are not in favor of it. Commissioner Fairbanks stated, I agree but the other side of the coin is some do not know what is going on in the department. We need to talk to them but some do not understand what it takes to run the City. Mayor Linin stated, I agree, but ones I have asked understand. I have not received a mixed response so feel it is a pattern. Commissioner Fairbanks stated, I feel the community would feel the SRO is something we need to have in our schools. We never know when it will alleviate a situation. Mayor Linin stated, through my conversations I have people tell me they feel like the police are out to get them. Commissioner Garcia stated, at the end of the day, we chose to do without an additional officer to give all employees raises. School district is contributing to have an SRO. I feel to operate within budget we have, we need to go back and review wish list. Commissioner Garcia stated, I have had same conversations that Mayor Linin has had. The City covers more at night because other agencies go home why do we not reduce number of officers on day shift? It is imperative to support the school on this. Commissioner Schields asked, do you believe we need to use present officer as SRO? Commissioner Garcia stated, we can make it work. Jessica stated, the school would like to be part of discussion of who officer should be because it should be someone that works well with students and feels comfortable with job. We feel it is important who it is and want to be part of discussion. Joni stated, the KHP does not feel a void for City. 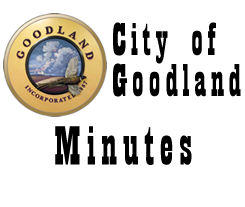 If a patrolman is headquartered out of Goodland it does not mean they are in Goodland. The Sheriff has four deputies that work the entire county. They do back us up if needed. KHP is an assisting agency but not an investigating agency. Sheriff staff is minimal. Rich stated, Commission needs to understand your departments are overlapping in many areas. All employees help other departments to compensate for positions that have not been filled over the years. We are asked to do more with less which we do it to make it work. I can justify more employees but trying to do what we can in keeping costs down. Everyone has cut back in many areas and doing more with less employees like you want us to do. Commissioner Fairbanks stated, that is why I feel it is important to compensate good employees. Sometimes we have to raise the bottom line and the community will understand. Commissioner Schields stated, I agree and feel the community would understand with an SRO but feel it needs to be an additional officer. Andrew stated, to use an existing officer you are taking a swing shift officer from staff for a forty hour per week officer. I feel the SRO should not be an existing officer. I feel Sheriff Office benefits from City staffing and calls we do. They do not feel running a 24-hour call out is feasible. Vice-Mayor Brumbaugh stated, I do not feel our budget is a good working model and am concerned with the whole budget. If you have good employees, you have to be willing to pay them. Mayor Linin stated, I agree unless insurance benefits increase a lot. We have to live within our means. Andrew stated, in 2019 we are moving economic development to the General Fund and trying to fund Self Insurance at a maximum for five years, we are in third year. We are looking at captive options to help keep costs down. We are uncertain what path is for healthcare and what benefits will be. Vice Mayor Brumbaugh stated, an SRO is a nine month position for school so City will have use of officer other months. Can this reduce our overtime budget? Andrew stated, it is hard to say what is going on and when they will need extra assistance. Mary stated, most of police overtime accumulates during holidays. Commissioner Garcia stated, a poll of Commission, shows Commissioner Fairbanks and Commissioner Schields would like to fund the SRO as a new officer while Mayor Linin and I would like to fund from an existing officer. No one debates the importance of SRO, we just have to see how we can make it work. Vice-Mayor Brumbaugh stated, property taxes are high here, where do we stop. They are double from where I came from and do not know where it is going, we have bare bones for what we pay. Bill stated, if we use an existing officer and school does not feel it is one to that will work, it is a problem. I also do not feel my proposal should dictate how a department functions; I do not want to hurt the police department, or any other City department. Mayor Linin stated, we are all in this as one, we just have to do what is right for community. Vice-Mayor Brumbaugh stated, I feel if there is an increase in health insurance,that is some acknowledgement to employees. I am not happy but feel can make it work. It is not riding on one position. Joni stated, we cannot function if you take an existing officer from my staff, it is for the betterment of serving the community. ON A MOTION by Commissioner Fairbanks to add an officer on a 50/50 cost share with school district at a cost of approximately $32,500 seconded by Commissioner Schields. Commissioner Garcia stated, this is considered growing government again. Vice-Mayor Brumbaugh stated, that is my concern, I want a lid on costs we allow within a budget. I would ask you to consider amending motion to allow SRO within levy rate presented tonight. Commissioner Fairbanks stated, we have cut the budget to bare bones, what is problem with increasing a fraction of a percent? Vice-Mayor Brumbaugh stated, we have to learn to find money with what we have. Commissioner Fairbanks stated, we as a Commission need to look at it before next year if we feel we have money that is not necessary. Vice-Mayor Brumbaugh stated, we have to plan for the event so money is available in the reserves. Commissioner Fairbanks stated, I do not feel any department is using money where it does not belong, they have been very conscience in spending. I will amend my motion to add an officer on a 50/50 cost share with school district at a City cost of approximately $32,500, finding money from the 50.02 levy presented tonight, Commissioner Schields seconded amendment to the motion. Bill stated, we will be here Monday to hear how you fund the SRO but I will withdraw request if it is at expense of current employees and departments being able to operate. Jessica stated, we have discussed an SRO but I want you to know the district does a lot annually to guarantee safety of our students. MOTION carried on a VOTE of 4-1 with Mayor Linin casting the dissenting vote. Andrew stated, would Commission consider following changes to make SRO fit within budget presented: 1. reducing Commission’s request of $10,000;, 2. Reduce transfer to GIRF from General Fund by $10,000; 3. remove the signage at police department for $3,800 and; 4. lower bulk fuel in Street and Alley $5,000 in 2018 and the same in 2019. Consensus of the Commission is to publish budget with these changes to make SRO work. ADJOURNMENT WAS HAD ON A MOTION Commissioner Garcia seconded by Commissioner Fairbanks. Motion carried by unanimous VOTE, meeting Adjourned at 7:45 p.m.